The Boston Youth Symphony Orchestra, conducted by Federico Cortese, presented a semi-staged opera performance on January 16, 2011, at Sanders Theatre in Cambridge, Notably, the BYSO is the only youth orchestra in the country — and probably in the world — doing this. 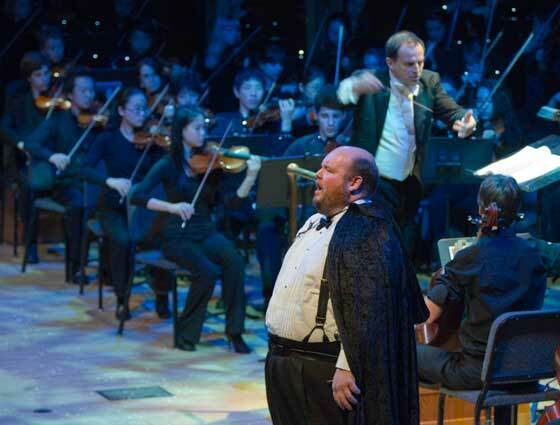 The ambitious undertaking (their fourth) was Giuseppe Verdi’s operatic adaptation of William Shakespeare’s Macbeth, utilizing a cast of professional opera singers and the New World Chorale; it was also presented in collaboration with the Consulate General of Italy, beginning a series of celebrations throughout the U.S. of the sesquicentennial of Italy’s unification. Thus, it was fitting that before the opera began, everyone stood as the BYSO played the two countries’ national anthems, the Italian sounding as if lifted intact from a Verdi opera — though its music was actually composed by Michele Novaro. Mounting even a semi-staged opera production is a considerable challenge in Sanders Theatre, despite its prized acoustics: the stage comfortably accommodates a medium-to-large orchestra and little more. Stage Director Marc Verzatt commendably achieved the best likely possible solutions. 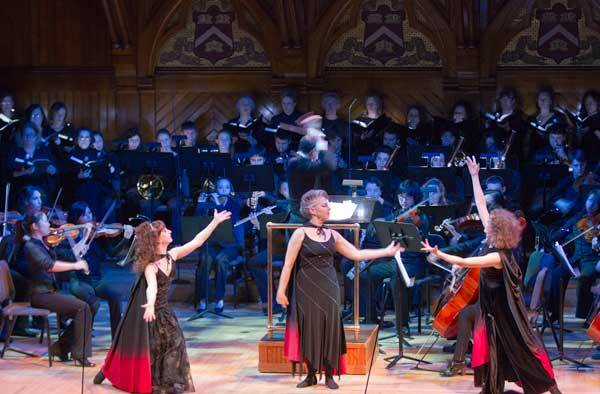 After an orchestral prelude in which Cortese and the orchestra skillfully conveyed trepidation alternating with outright terror, the opening scene’s Weird Sisters, three skilled dancers (Maureen Kelly, Catherine Ulissey, and Laura Young), used their four-foot wide strip of stage to full advantage, while the New World Chorale‘s women, arrayed behind the orchestra, sang the witches’ text. The narrow balcony above the orchestra, too small to accommodate even the half-chorus, was only used near the end to display the apparitions the Weird Sisters show to Macbeth. Most of the time, the full chorus was stationed in the right balcony, there being insufficient room onstage to put them all there. To be frank, it was a pleasant surprise that instances of wayward ensemble and balances between them and orchestra happened so infrequently, given the challenges of their hearing each other. This performance of the orchestra was extraordinary for its professional finish: one quickly forgot that one was listening to youngsters. The intonation was reliable, the responsiveness to singers (via the conductor, of course) was exceptional, and the tonal qualities of each instrumental choir were well blended and pleasing to the ear. The end result was still more impressive in that the performance took place in a setting not conceived for, nor especially conducive to, opera. Most astonishing of all, the performance was actually done by two different chamber orchestras, the BYSO Sinfonietta for Acts I and II, and the Camerata for Acts III and IV. The groups were relatively large (46 strings in each orchestra), yet under Cortese’s careful direction, they did not overpower the singers. In a number of the sections, there was no duplication of players, although some, like strings, had a few. All horns, harps, and the one English horn were in both orchestras. Mind-boggling, even given that there were a few “guest artists” — and they were almost all BYSO alumni. Yet there was no discernible change in intonation, phrasing, or technical skill. Hard to believe they were teenagers — or younger. In a particularly nice touch in the program book, three players contributed essays on their impressions of preparing for the concert. Lady Macbeth’s character is established virtually from the start, as she reacts to her husband’s letter recountng the witches’ prophecies. In her first aria, an appeal to hellish powers, she shows her determination to stiffen Macbeth’s resolve to commit whatever bloody acts are necessary to attain maximum power. Soprano Diana Jacklin took no prisoners, giving her all both musically and dramatically. She possesses a striking voice, having begun her career as a mezzo before transitioning to genuine dramatic soprano. Ergo, her decision to liberally employ chest voice was more an aesthetic choice in characterization than a practical necessity to be heard. For Lady Macbeth is no lady, though of course she can simulate one when circumstances require. Jacklin’s singing, if not ideally clean in the fast runs, still crackled with excitement. The orchestra provided her nuanced and flexible support and excitement in its own right. Another notable strength of this production was the uniformly solid acting throughout the cast. There is a touching farewell of sorts between Banquo (Milner) and his young son (Christopher Laven), who both have premonitions of Banquo’s approaching murder. Otey makes Macbeth’s first stirrings of conscience after King Duncan’s murder develop convincingly into paralyzed horror when he alone sees the bloody ghost of Banquo at a banquet. And Jacklin is horrified and enraged by her husband’s risking self-incrimination but simultaneously has to put on a bright face for the court, while singing a spirited brindisi. In the fourth and final act the vortex of events is tightening, one murder having begotten a host of others. It opens with the moving chorus “Patria oppressa”, lamenting the dire state of Scotland under Macbeth’s tyranny. The New World Chorale gave a committed, powerful performance. Hard on its heels comes Macduff’s searing lament for his murdered family, partly self-flagellation for having left them alone and vulnerable, partly malediction on Macbeth. Having waited so long for his moment in the sun, tenor Brian Landry made the most of it, investing his aria “Ah, la paterna mano” (“Alas, the fatherly hand was not there”) with intense grief and anger while maintaining sovereign vocal control. Malcolm, surviving son of Duncan, does not get an aria of his own, but Steven Sanders has enough to sing to reveal a mellifluous tenor with lovely legato. Lady Macbeth’s famous sleepwalking scene finally gave Jacklin the opportunity to show her capability for introspection as well as the grand dramatic gesture, and she gave a fine account of this quasi-mad scene, the intensity of her guilt matching that of her earlier ruthless ambition. The orchestra gave atmospheric, subtle, and beautiful accompaniment. In the end, Macbeth takes the opposite direction: the last set of visions and prophecies from the witches has convinced him of his invincibility, and any remorse he had previously felt is now gone. Even news of his wife’s suicide barely gives him pause. Though he is shocked by Macduff’s revelation of how the prophecies spell doom for him, he nonetheless takes up his sword and goes down fighting in “anti-hero” fashion. If the concluding cheery hymn of praise to the liberator Macduff seems overly brief and insufficiently healing after so much trauma, perhaps it is Verdi’s intention to show obliquely that the scars left by despotism can’t be healed instantly. In any case, the performers gave us a rousing and emphatically optimistic ending befitting the triumph achieved by Boston Youth Symphony and Signor Cortese. Sic semper tyrannis and bravi, tutti! Very well written, although I disagree that “more thought should have been given to avoiding anachronistic costuming.” In fact, I liked the idea of blending old with new in order to give the performance a timeless feeling as the themes of any Shakespearean work can be applied to any point in human history. I agree with Reader; it was a “concert” production, semi-staged. The costumes were props, and no more. And they worked. I do wish Laura Young had not worn glasses, though; they WERE an obvious anachronism, especially for a dancer… As someone blind as a bat, if I could dance, which I can’t, I believe I could have negotiated the stage sans spectacles without falling into the audience. BYSO gave Boston the most artistically successful event of the season. Believe it. Thank you, Geoffrey, for this informative review. The orchestra was astoundingly good: the strings wept; the brass roared. The performance was magnificently Verdi.